Since my kids love all things rainbow, we decided to get a head start on St Patrick’s Day crafts. 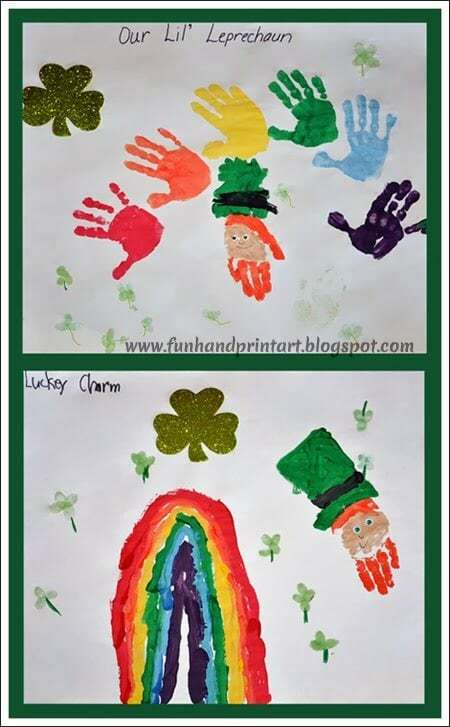 We ending up making a handprint rainbow and leprechaun. Big Brother is learning about leprechauns in kindergarten right now so it ties in perfectly. Today he told me that when I say leprechaun trap I have to whisper the word ‘trap’ and if he catches one he will get his pot of gold….. too cute! We started with the color red. I painted my daughter’s hand and then made a handprint on one side of the paper near the edge. Repeat these steps to make a handprint for each color of the Rainbow going in an arc shape. Big Brother chose to paint his instead. Paint all 4 fingers orange as well as the bottom of the palm (just a small stripe). We made one with the thumb painted and one without. Paint the remaining areas a peach-toned color. Press down on paper with the fingers in a closed position (so they are touching each other). I drew an outline of a hat which the kids then painted green with a black stripe. When dry, add googly eyes and draw a nose and mouth. My son used green googly eyes for his leprechaun. The kids made shamrocks by dipping their finger into the green ink pad and then stamping it on the paper. Make 3 or 4 of them in a cluster and draw on a stem. Big Brother wrote ‘Lucky Charm’ on his and I wrote ‘Our Little Leprechaun’ on Little Sister’s. Looking for more inspiration? Check out our St Patrick’s Day archive! I love this idea! I am going to do this with the kids tomorrow! ;Thank you for stopping by the Thoughtful Spot Weekly Blog Hop this week. We hope to see you drop by our neck of the woods next week!